The girls from the upcoming mobile game “BanG Dream! 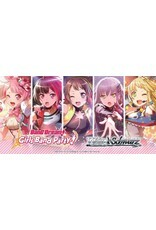 Girls Band Party!” are joining the Weiß Schwarz stage! Featuring the vibrant scenes from the mobile game! What’s more, cards in this booster can be mixed together with cards from BanG Dream Booster Pack released in June 2017! Gold Foil Hot Stamped Sign Cards from the 25 voice actresses included! There’s more! Alternative Color Foil Hot Stamped Sign Cards are also included! Special packs containing Hot Stamped Character Sign Cards from all 5 characters in a single band are randomly sealed in cartons!